This September the Substance Abuse and Mental Health Awareness Administration wants you to celebrate recovery. Much of the Administration’s focus is on the opioid epidemic, which has in recent years reached even rural areas of the country like Susquehanna County. On Saturday about 30 attended a Town Hall on opioids at the Susquehanna County Library in Montrose and discussed issues surrounding addiction, treatment and how to pay for it. The Substance Abuse and Mental Health Awareness Administration is part of the federal Department of Health and Human Services. The event was sponsored by Marc Friedenberg, the Democratic nominee for the recently redrawn 12th Congressional District. The seat is currently held by Tom Marino, a fourth term Republican. Friedenberg is a teacher of technology law and policy at Penn State. 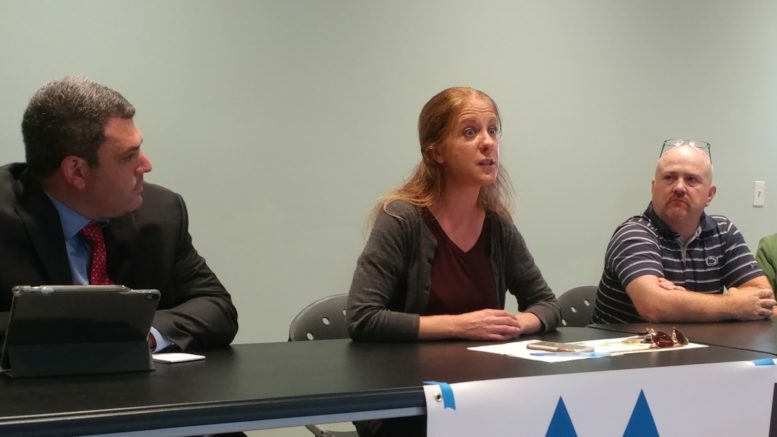 One of the speakers included his former opponent in the Democratic primary, Judith Herschel of Susquehanna, a certified drug and alcohol counselor, whom Friedenberg beat by a narrow margin. Dave Passetti of Barnes Kasson Hospital also appeared on the panel to discuss drug and alcohol counseling programs such as Trehab and medication assisted therapy programs. “It’s going to take our elected officials continuing to advocate for the necessary funding for treatment in our rural communities and putting forth legislation that supports recovery and does not hurt them,” Herschel told the audience. “You see the awful aspect of this disease is that it affects every aspect of who we are, each and every one of us. It affects our children; it affects our family; it affects our schools, our jobs, our businesses, our neighborhoods. If effects our health care system, our legal system. It affects everything. We still have a very long road ahead of us,” she said. According to data provided by the U.S. Drug Enforcement Agency in a July 2017 report Analysis of Drug Overdose Deaths in Pennsylvania, 2016, the drug overdose rate in Pennsylvania in 2016 was 36.5 per 100,000 people. For Susquehanna County, which has a population of just over 40,000, the drug overdose rate that year was 18.5. By comparison, the drug overdose death for that year in neighboring Bradford County, with its population of just over 60,000, was 27.1. Another speaker, Susquehanna County Commissioner MaryAnn Warren, acknowledged the need for more services in Susquehanna County. “What we have seen with so many overdoses, so many deaths, we have seen grandparents who are now taking care of grandchildren, we see families that are over in Children and Youth Services exceeding numbers that we’ve ever had before because children are being taken away from parents and being put in foster homes. And babies are being born already addicted,” Warren said. Warren has joined others to establish the Substance Abuse and Recovery Initiative, which will start meeting this week, and which she hopes will help develop local ways to provide solutions to problems facing people facing drug and alcohol problems. “We’re looking to bring all of those people to the table and to find some of the answers to get more resources into the county and to get people connected to the resources that we already have,” Warren said. Some inroads have been made, she reported. One included the county’s successful voluntary Drug Take Back program. Warren told the audience that Sheriff Lance Benedict told her his office had collected 2,000 pounds of unused prescription drugs since the program was started in 2011. Another inroad, Warren said, is the establishment of the Dial 211 Help Line with the help of a $10,000 grant from the United Way. Similar to the well known 911 emergency number, the free, confidential, 24-hour a day service can connect dialers with local services for a wide range of issues from Drug and Alcohol problems to Child Abuse or neglect reports, disaster recovery and even anti-bullying services. Those in recovery, Herschel said, need boatloads of support, particularly when returning to the same environments from which the negative behaviors were learned. In these types of circumstances, Herschel said, healthy relationships are very important. Other, traditional societal pillars may also play a useful role. “Churches can be a healthy steppingstone into a healthy relationship,” Herschel said. Mirroring lawsuits filed years ago against Big Tobacco companies over the dangers of smoking, court dockets over the last year have swelled with lawsuits against opioid producing pharmaceutical companies claiming that drug companies hid the highly addictive nature of opioids. Sandy Vieczorek, who traveled from Wyoming County to attend Saturday’s Town Hall, asked Friedenberg whether, if elected, he would support legislation which would insure that any monies from opioid lawsuits would go directly to combating opioid addiction. “Ideally we would learn from the tobacco class (action lawsuits) that it would be, that we would learn the value of telling the truth, either to consumers in that case or to doctors, perhaps, in the case of the opioid epidemic. I don’t think we have fully and we haven’t internalized it yet but that’s what we’re always striving for,” Friedenberg said. Friedenberg’s opponent in the November 6 general election, Tom Marino, authored the controversial Ensuring Patient Access and Effective Drug Enforcement Act, signed into law by President Barack Obama in 2016. Once a nominee for the post of President Donald Trump’s Drug Czar, Marino withdrew his name from nomination after media reports linked him to the law which limited the DEA’s ability to, among other things, halt what they considered suspiciously large shipments of opioids. The law came under intense fire even from Marino’s Republican colleagues. Be the first to comment on "Opioids, addiction the focus of town hall"